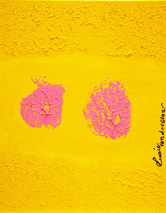 Paintings by breast cancer survivors for The Art Cure, a breast cancer awareness art project founded by Tatiana von Tauber, in which all paintings (including dozens of international artists' work) were auctioned off. 100% of the funds collected were donated to local Savannah breast cancer organizations. Visit the official blog for detailed information on the project and artists. Get a free digital copy of The Art Cure Diaries on the link below! TATIANA VON TAUBER® presents THE ART CURE Project, a means in which to introduce art as a means of personal healing, discovery and expression while coping through life's many hills and valleys. 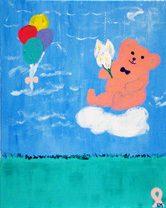 These are paintings created by breast cancer survivors for THE ART CURE Breast Cancer Awareness Project. Free IPAD version through Blurb.com here! Free online preview only (all pages) here! 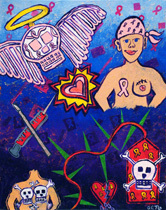 Purchase a print copy of The Art Cure Diaries here! THE ART CURE DIARIES is a compilation of artwork painted by breast cancer survivors, their family members and/or friends and documents the artistic journey of strong and beautiful women, shares their personal stories and exposes their inner artist. Many had no idea a hidden artist sat dormant within them. Tatiana von Tauber, founder of The Art Cure project intended to introduce art as a means of self-therapy, expression, solitude, joy and a source of healing with hope these women continue to explore art in their lives and harness its many benefits. Visit the official blog of The Art Cure, Breast Cancer Awareness Project to learn more about the project, view the exhibition and learn about the participants.